Oh yeah, a little administrative type thing for the new year. I've got my little blog here running on Dreamwidth, at the name you might guess, in consideration for those who don't favor the previous round of Russian shenanigans around here. Also if someone knows how to set a Dreamwidth blog to post at a set hour, rather than just set the official date-and-time and hide stuff as private until it should pass, please let me know. I can't figure it out myself. 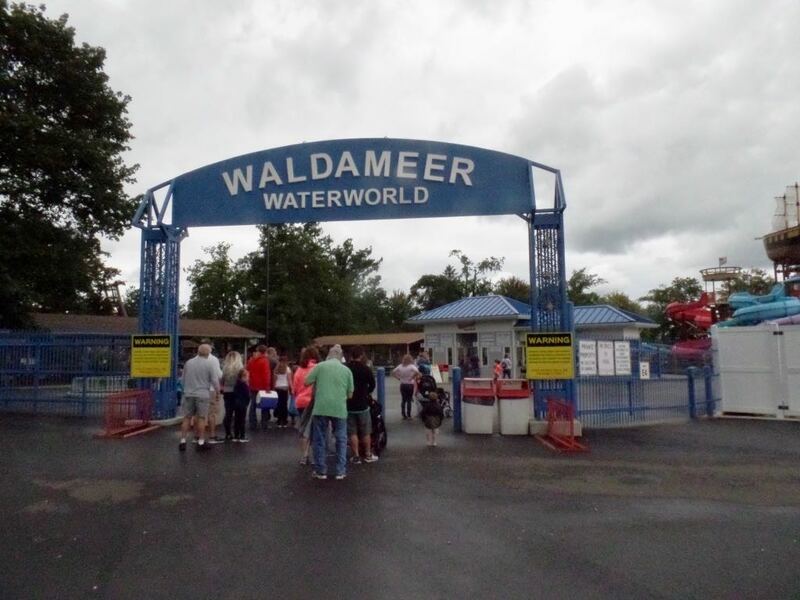 Our Conneaut Lake Park visit from Labor Day weekend and how am I never not three months behind realtime here? 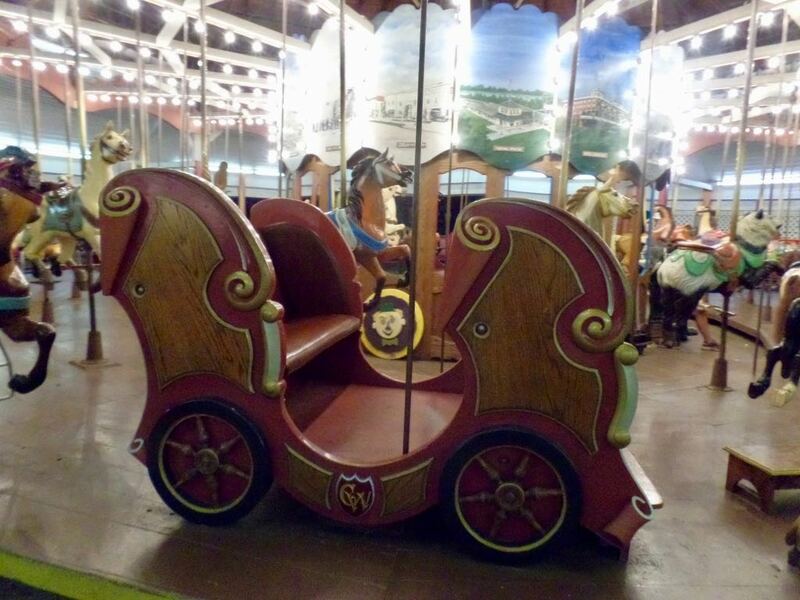 The Tumble Bug, sister ride to Kennywood's Turtle, was in good form. It chugged along a bit rougher than the Turtle, as ever, and I think I managed to stay in my seat without holding on to the wheel at the center. Still, it's a rare ride and it was worth visiting. Around this time we noticed that the water park was not running. The water had been shut off at the slides and there weren't any people in the lazy river. This would be the weather's fault: it was a cool day, threatening rain. It wouldn't quite be crazy to go swimming, but it was near enough. I guess if you really wanted to get wet you could just go down to the beachfront and use the Conneaut Lake proper. We did walk down to the lake proper. It was a chance to look over the much-battered midway, which had a couple of games open this time around. And nearly all the lamps had light bulbs, and protective covers for the bulbs, again one of those little things remarkable only for how recently the park didn't. We also spent some time investigating the remains of the ballroom, burned around 2012, and trying to make out from the remaining bits of tile and gravel where the limits of the building had once been, and what might have been a patio and what might have been the interior bathrooms or whatever. I spent some time trying to imagine the days decades past when the park was a wholly reasonable thing, bustling as a local park might, with a ballroom regularly active, and I suppose my imagination failed but it felt good to try. Then we went along the waterfront towards the hotel. 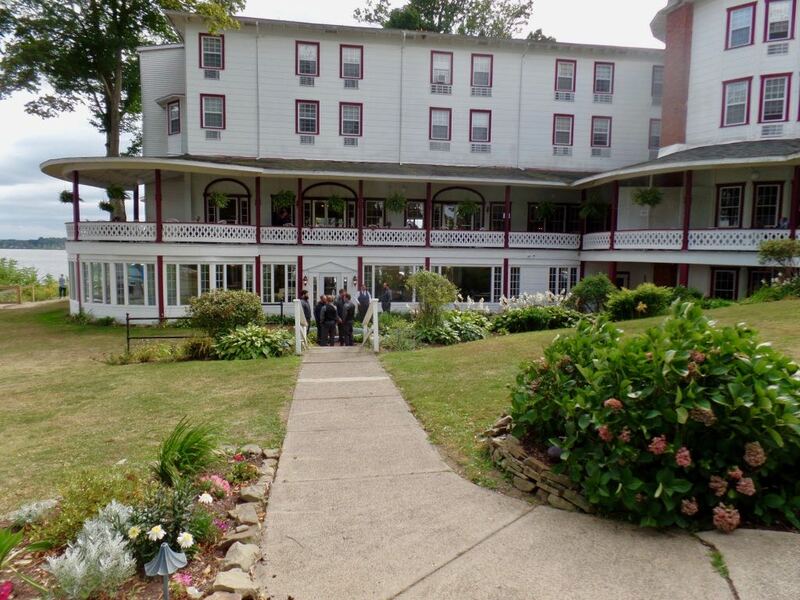 The Hotel Conneaut had closed, as a passenger-carrying thing, last year after the boardroom drama that brought the park into a healing bankruptcy. Very few of the guest rooms, by reports, were in fit shape to rent, and the current management has given up on those until renovations can be done. But the hotel still has event facilities, and is keeping them up. For example, weddings. For example, the wedding going on that day. We passed a small pack of guys in suits huddled beside a ground-level entrance. Along the boardwalk there saw a flock of folding chairs set on a short grass-covered pier with stairs that had signs messaging stuff like ``From This Day Forward'' and ``For Better Or Worse'' and ``For Rich or Poor''. Everyone but the suit-clad men seemed to be gathered around a bar, so I suppose we were there before the ceremony had gotten started. Good to see the park and the hotel functioning so well. There were three other rides we really wanted to get to, and did. One's the bumper cars. 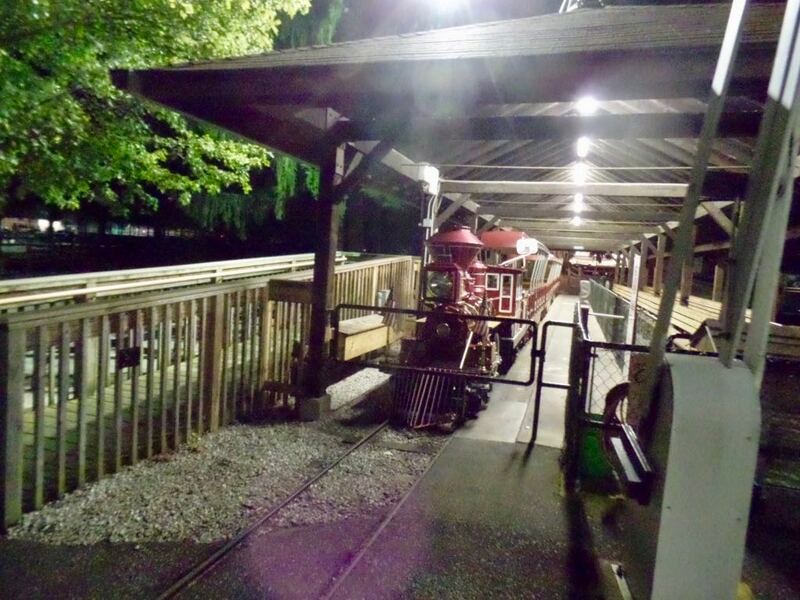 The park's got a normal-size bumper car ride, but only four of the cars are still functioning. They're still running, or at least able to run, at the slightly mad speeds that you would expect. At one point we found that devotees of the park have settled on names for the cars, and would keep track of how each of the surviving functioning cars was doing. I'm sorry not to be able to point you to this. 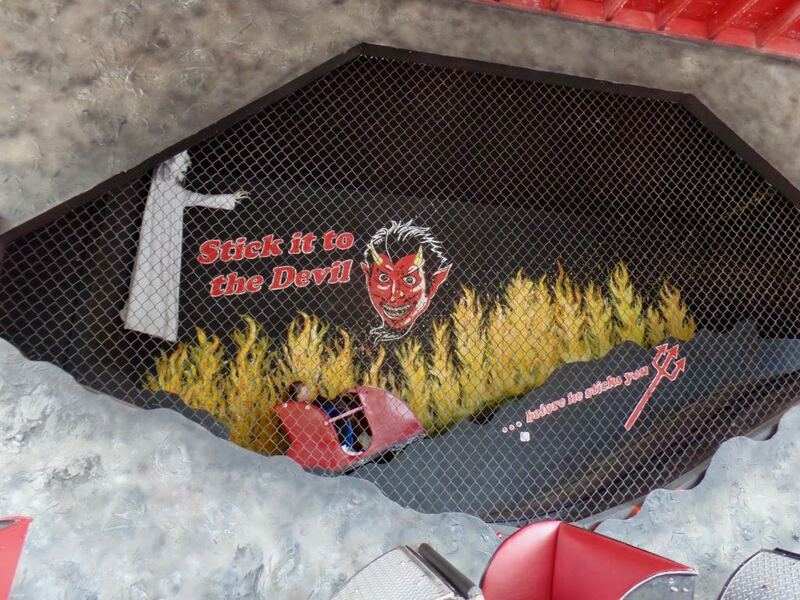 The Devil's Den, the dark ride and arguably a roller coaster, was also running and in happily good shape since its 2013 painting and touching-up for that attempted Travel Channel show where they'd rescue amusement parks. (They seemed to be going for a Kitchen Nightmares But Amusement Parks show, but how many distressed amusement parks are there?) Roller Coaster Database and the Coaster-count site list it as one now so I guess I should list myself as having 198 roller coasters. It's mostly a little dark ride, shuffling back and forth between fluorescent-painted spooky scenes. But there is right up front a small, sharp dip that is definitely gravity-driven rolling of a car on a track. The gum wall, and its encouragement to stick it to the Devil before he sticks it to you, was there, in good order, and no I was not going to touch a wall full of people's used chewing gum. And we rode the Witch's Brew, which is one of a handful of these kinds of rides left. It's a spinning car which itself spins, with a partner, on an axle that spins once more opposite a separate pair of cars. And it's on an incline. And if you get lucky it spins a lot. This time we got lucky, so lucky in fact that I was feeling uneasy when we got off. And I'm the one that doesn't get motion-sick. I think this is the time we also heard someone else getting on, to the other car on our arm, asking the question whether there was a seat belt. It's a funny idea for the park. This saw us successfully visiting everything we felt we had to get to in order to appreciate the park's important offerings. There's more rides, like a Tilt-a-Whirl which that Travel Channel show tells us is a unit dating to the 40s. But they're less intensely part of what we hope for when visiting the park. 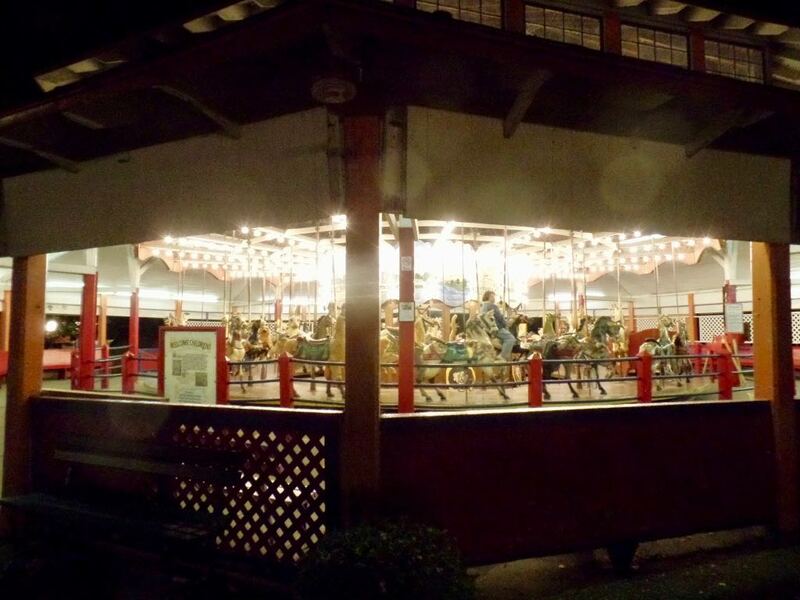 We could focus instead on just taking in the atmosphere, re-riding the carousel and the roller coaster and the Tumble Bug, appreciating how well the park was functioning, things like that. Trivia: The price of bread rose about 50 percent in Paris between 1845 and 1847. The price of potatoes nearly doubled. Source:	 1848: The Revolutionary Tide in Europe, Peter N Stearns. PS: Some more Texas stuff, before the second day of the pin-golf tournament. Family plot for W Lee ``Pappy'' O'Daniel, a biscuit-advertisement-jingle-writer who parleyed his ``pass the biscuits, Pappy'' catchphrase into a novelty act as governor of Texas and then Senator position because now and then democracies fall for a novelty act, and Texas does too. We were here for a letterbox commemorating his odd career. The Nickelrama Arcade, where we hoped to spend a few hours before starting the pin-golf tournament. It turned out to be incredibly packed; you can kind of see the line waiting outside the door for permission to enter. bunny_hugger playing the Aerosmith game that made its debut the tournament weekend and that was so new that when it crashed --- literally powered down and wouldn't restart --- the counter staff had no idea the game even existed, much less that they had it. There she goes and knows I'm dying when she says, 'Who is Johnny'?